Approaches to Teaching Marguerite de Navarre’s Heptameron, a volume edited by Colette Winn, is an invaluable resource, for teaching the Heptaméron and other works by Marguerite de Navarre. 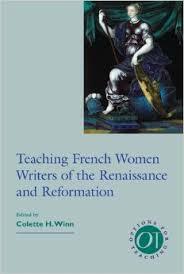 Colette Winn’s other edited volume, Teaching French Women Writers of the Renaissance and Reformation, also offers a multiplicity of approaches and strategies for teaching Marguerite de Navarre. Faith Beasley and Katharine Ann Jensen’s edited volume, Approaches to Teaching Lafayette’s The Princess of Clèves, has an article by John D. Lyons on teaching Lafayette’s work with the Heptaméron. I highly recommend it!